Another Kind of Nerd: Oops. I made a flippant Nazi remark while in public in Germany. Yeah. Oops. In other news, I'm back to picking up some random food item not available (or only limitedly available) in the United States. While in England I focused on candies, generally speaking. You know, all Cadbury has to offer. I do realize that you can get Cadbury in America, but it's not really the same. As an example, eating a Cadbury Egg before Easter didn't make me want to vomit. Other gems that I would heartily recommend: Jaffa Cakes and Reggae Reggae sauce. My initial purchase was an item that looked like Cheetos Puffs and had the same texture but was peanut flavored, Erdnuss Locken. I am a peanut butter enthusiast. I start many of my days with peanut butter toast. Why not try the strange Cheetos-like German peanut chips? They were that unexpected good... the kind where you just keep eating them even though it's so. very. strange. This week, I decided to up the ante. 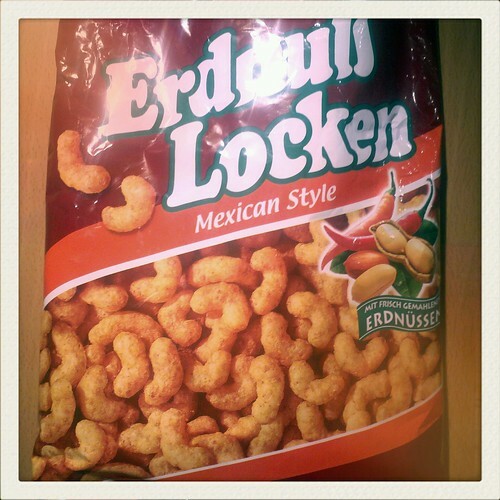 I purchased the "Mexican Style" Erdnuss Locken. I'll admit, I was afraid. This should in no way surprise: there is no good Mexican food here. And why should there be? Anyway, I do get cravings for Mexican food and I have made Mexican food as well as I could with the options available to me. But here before me, in the small German grocery store in the small German village I am staying in, were two great loves combined! Mexican Style and Peanuts! I had to buy them! And the force of their goodness compelled me toward excessive exclamations of enthusiasm! No really. They were good. I'm not kidding. Think about other glorious peanutty-spicy combination much loved: pad thai, thai peanut curry, etc. Magic. All-in-all, a total win.